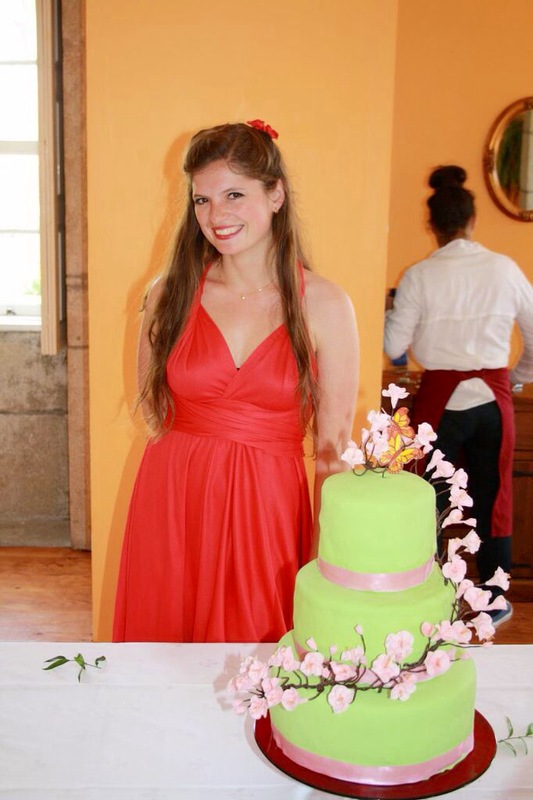 As I mentioned before, the bride had left the cake totally up to me! So much for bridezillas. I had decided on a three tiered square, white cake with cherry blossoms sweeping down the side. She was very pleased with the plan, until she got reading about feng shui in weddings. The cake should be round as a symbol of harmony and as tall as possible. It shouldn’t be white. I had already bought the fancy multiway square tin but I figured I could cut the cakes into rounds. I prefer them round anyway. I had chosen the square so I only had to buy one tin that I could take back to England easily. As for the colour, well, that was a bit of a shame because I think it would have looked pale, but I wasn’t the bride and it was all about pleasing her. She wanted green, the colour of new beginnings together with the pink cherry blossoms, the colour of unconditional love.